This photo collage includes two sunset bride and groom portraits during a Black Creek Pioneer Village wedding. The beautiful picture on the left, is actually a composite of two photos taken a few seconds from the other towards the end of the big day in front of the venue. 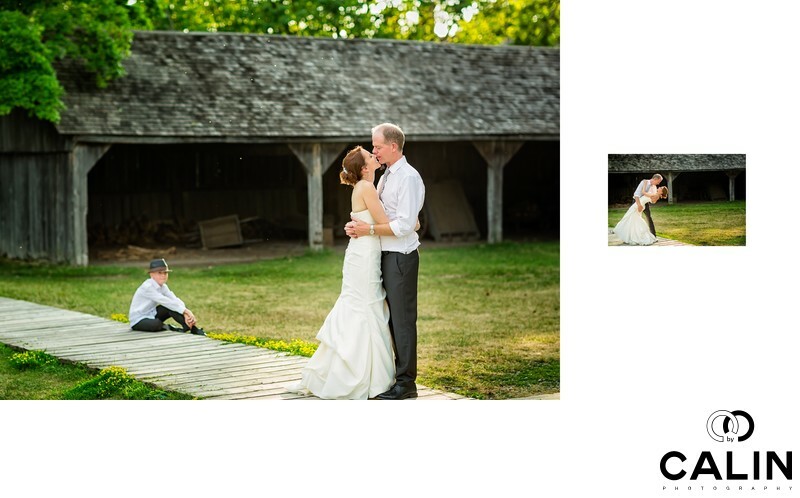 At times, in order to create beautiful wedding photography I have to use Photoshop. The first shot was one where the bride and groom's son was looking at the couple. The second image was one of the bride and groom sharing a passionate kiss. Because of the way this picture is composed, it stands out. The placement of the son and of the couple creates a natural diagonal, which gives this wedding photo dynamism. Also, the boardwalk is an actual leading line emphasising the subjects. The sunshine from behind a couple illuminates the tiny mosquitoes flying in the air, which creates the illusion of fairy dust. I took the image on the right in the same spot, specifically between the Town Hall and the Town Hall Drive Shed buildings. This image portrays the groom dipping the bride in a romantic embrace. Although it is a typical wedding photo pose, the quality of light and the intensity of the moment, make this image unique. Because the picture on the left includes all three members of the family, it carries a bigger weight, so it occupies two-thirds of the album spread. Interestingly enough, even though most of the guests were having dinner at the venue, a few kids saw us taking pictures and joined us, which was a lot of fun.